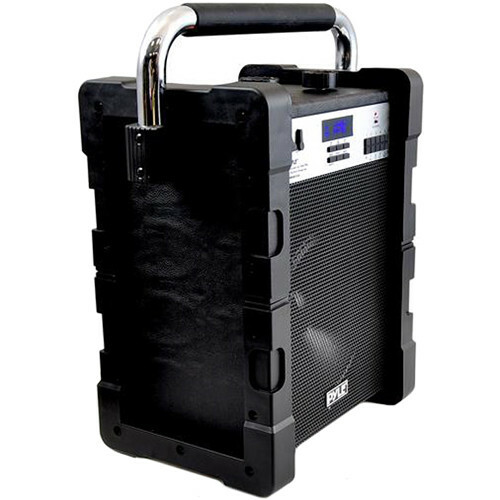 The black Jobsite Boombox from Pyle Pro is a rugged portable speaker designed to withstand the rigors of a work site environment. The system is capable of up to 100-watts peak, 50-watts RMS output while offering a variety of input connectivity options including Bluetooth streaming audio for playing back audio from your compatible device, an integrated FM radio, and USB and SD ports for playing back MP3s. The USB port also doubles as a charger for your phone or tablet. The rear panel features controls for mic volume, echo, bass, and treble, as well as dust covers for all ports and connectors. Additionally, the unit offers a 120 VAC outlet to power external devices. The Jobsite Boombox ships with a power cord and a 1/8" to RCA cable. Box Dimensions (LxWxH) 19.4 x 16.5 x 10.9"
Jobsite Boombox - 100 Watt 8" Bluetooth Portable Speaker System (Black) is rated 4.3 out of 5 by 3. Rated 5 out of 5 by Mark from Excellent sound, volume, function for low price. I compared this unit (physically side by side) to several other brands at similar price point. The Pyle is superior in almost every aspect. Best sound, lightest weight, has Bass Treble adjust (many others do not), great volume before distortion, ease of use, and such. Monster, Ion, and any of the tool brands sound much worse, or are clumsy to use, or are heavy. At this price (lowest I could find for a unit this type), the Pyle Jobsite is a must for anyone wanting portable outdoor sound that can fill a jobsite easy with sound. But if it rains, or you take it to wet locations (boat, beach) be sure to cover the ports with tape or something. The only poor thing about this Pyle is the weather proofing - the rubber plugs (water stops) are junk - they are poorly designed. The other units are much better weather proofing. Rated 3 out of 5 by Titan from Not bad This speaker is okay, I would give it 3 out of five stars. Not incredibly loud in noisy environments, connectivity is easy, and very portable. Lots of distortion at max volume. Rated 5 out of 5 by Gerald from Love It I just purchased this about a month ago and I absolutely love it so far . I use it at work which is a fairly loud factory and it is perfect for listening to music .